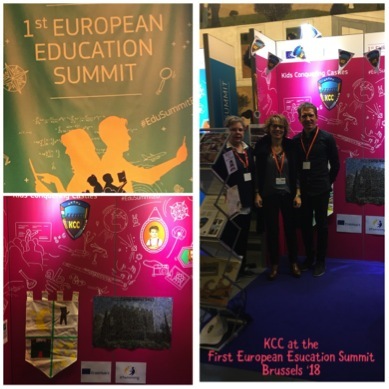 First European education summit Brussels - kcc-erasmuss Webseite! 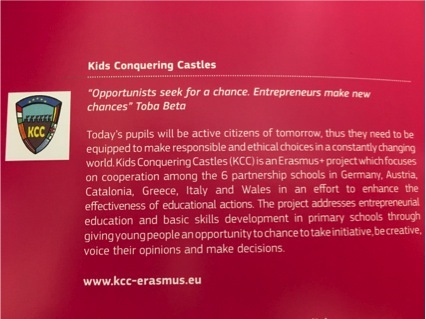 KIDS CONQUERING CASTLES AT THE FIRST EUROPEAN EDUCATION SUMMIT IN BRUSSELS! We were invited to present our project at the Ideas in Action exhibit at the First European Education Summit “Back to basics: for an innovative, inclusive and values based education", which took place at The Square in Brussels on 25 January 2018. The Summit, organised by the European Commission, brought the education world and the wider world together – Ministers, academics, stakeholders and civil society – in order to discuss the vital role education has in building fair and inclusive societies. The Summit focused on the low achievement in basic skills of young people across Europe, the urgent need to address inequalities in education systems and better investment in education. Participants worked towards a high-level political consensus on tackling inequality in and through education as a means to address underachievement in basic skills and foster social cohesion. In addition to the Summit's programme of over twenty sessions, the Summit also included a dedicated interactive area with exhibition stands – the Ideas in Action exhibit – to show best practices, exchange ideas and engage all participants in an open and fruitful dialogue providing inspiration and incentives for future partnerships. The Ideas in Action exhibit showcased around 15 projects funded under, in particular, Erasmus+, Lifelong Learning Programme, Marie Skłodowska-Curie Actions, Horizon 2020 as well as a few flagship initiatives of the European Commission. · It involves the whole spectrum of actors in education, training, youth and sport from different levels with different perspectives (from grass-root level to networks with a broader approach). · It provides a direct link to the different Summit sessions, such as the masterclasses, the workshops or the panel discussions. Roland and Marita from Germany and Fina from Catalonia were present at the event.